Hello everyone! Welcome back to Lyrics of Legend! This is the first post where I will be sharing someone else’s lyrics instead of my own. These lyrics were written a while back by a friend of mine on Google+, Google’s form of social media. Actually, she was the one who inspired me to start writing lyrics to video game music in the first place. Out of the many that she has written, this is my personal favorite set of lyrics by her. While the track itself isn’t a super well-known track from The Legend of Zelda franchise, it is usually enjoyed by those who know it, and these lyrics add even more to it. With all of that said, I present to you: From A Link to the Past, the Dark Death Mountain by Sara Ross! Give up right now, you won’t make it! And if you do, you just might live! If you have hope, I will break it! I will take everything you have to give! That I can use someone like you! Join me now or prepare yourself to lose! I won’t give up, nor will my spirit break! I’ll not join you, though my life you should take! I shall oppose you until my last breath! The edge of my sword shall be your death! Ganon’s part seems to line up quite well with the deep trumpet sound in the track, and I especially appreciate Link’s response along with the synthetic violins at the end of this theme. While this is not a series that will be based on user submissions like Artists of Legend is, that does not mean that I will not accept submitted lyrics from readers! If you have lyrics to a specific track that you’d like to share with me, just leave them in a comment below or message them to me on Twitter. They might end up appearing in a Lyrics of Legend post eventually! 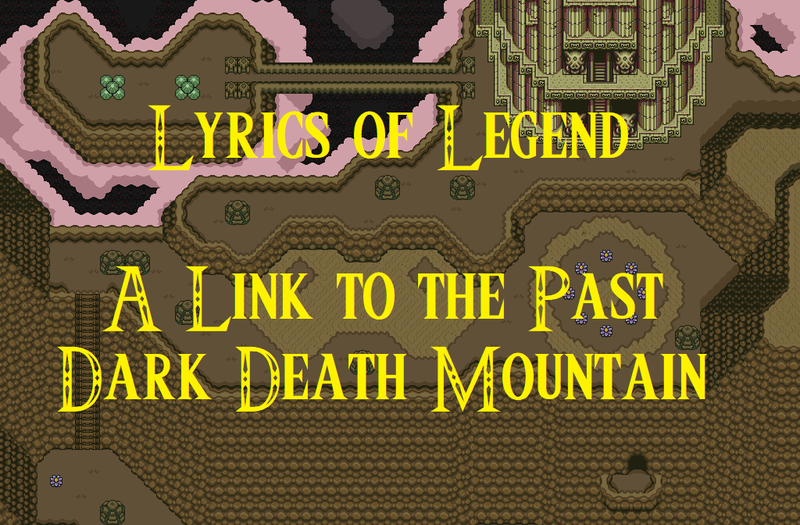 I hope that you enjoyed these lyrics written by Sara Ross to the Dark Death Mountain theme from A Link to the Past! I look forward to sharing more lyrics with you next time!